My Mother, Father and myself stayed in the newly refurbished Mews Cottage very nice it was too, the food as always was excellent and the portions huge, also the friendliness and helpfulness of the staff was most welcome. I hope to visit again we will have to see. Thanks for a most enjoyable weekend! My husband and I recently revisted the Wilson Arms after a twenty year gap. We had previously stayed before we had our family. I was delighted to hear that the it is still run by the same family. We had a delicious evening meal, the service was second to none, and the food was exemplary. I would highly recommend this restaurant for families and couples alike. I am looking forward to visiting again very soon, and it won’t take me another twenty years. We recently stayed here following a Groupon booking and the experience far outweighed our expectations. Firstly, it is an absolutely great location, perfect for long country walks and experiencing everything the area has to offer. Secondly, the customer service is second to none. Every single member of staff was absolutely attentive to our needs and the standard was among the best we have experienced. The food…excellent. Everythig was fresh and cooked to perfection. First class menu to accompany the customer service. Breakfast was the best I have ever had in BnB or hotel and the evening menu was varied and again extremely tasty. The accomodation we stayed in was far comfier than our own bed so slightly disappointed coming back home!!! Quilt to cushions to pillows, it was an extremely good nights sleep after the epic walk we’d been on that day. The room was tastefully decorated to a high standard and had a lovely country/cottage modern feel to it. As a by issue for anyone with dogs…dog friendly and ours loved it. The staff were very accomodating for our four legged baby boy! All in all an extremely lovely trip and we will definitely be back and recommending to friends and family alike. Just got back from a 2 night stay and we stayed in the Mews accommodation. Great website which encouraged me to book. The owners and staff were superb, very friendly, nothing was too much trouble. Food was excellent (and there is no need to eat elsewhere because it is so good), accommodation was excellent. This business deserves its reviews and all credit to the hard working owners and staff. We will definitely stay again. 10 of us had a meal here to celebrate a friends 50th birthday. From initial contact to reserve the table to having the meal, we received excellent service. The owner even provided us with a free taxi service too and from our holiday accommodation! They kindly decorated the table and were happy to display a variety of photographs around the room. The food was really good and we had a great night. We would definitely recommend to friends and family. …The jewel in the crown was the food. We had initially decided to eat there on our first night and then eat out at nearby Coniston or Ambleside, but we were so impressed with the choice we decided to also stay there for our second night. The ingredients were fresh and the size of the portions were extermely generous (although I think there was always room for some white chocolate cheesecake!). We have only been home a few days now and we are already looking in the calendar for when we can book again – hopefully to take advantage of the newly refurbished apartment that includes a huge hot tub! 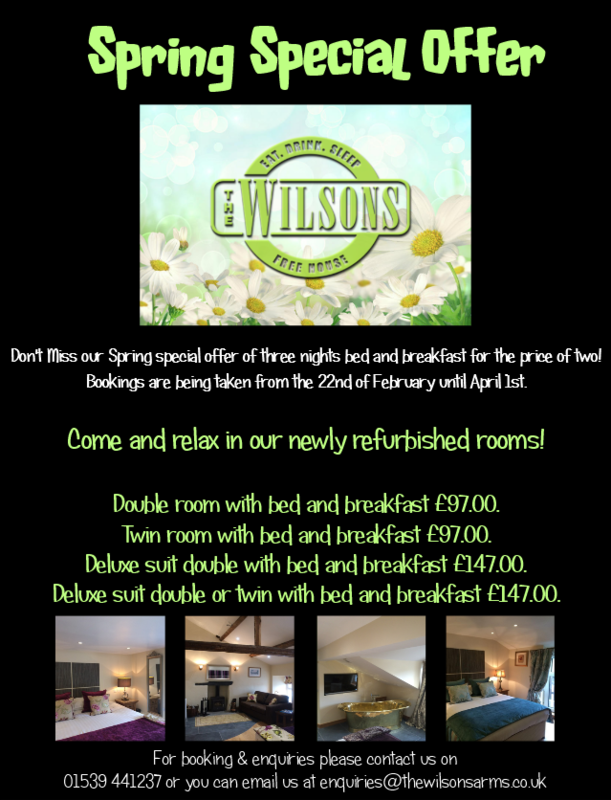 This was our first stay at The Wilson Arms, from our arrival we were made extremely welcome, the room was a good size and the bed was very comfortable. Matthew and all the staff were very cheery and nothing was too much trouble. Everywhere was very clean. We had our evening meal in the restaurant; our meals were substantial and beautifully cooked and next morning the full English breakfast was well presented and again a generous size and the coffee was good. We left having had a lovely weekend and feeling we had been well looked after and looking forward to a future stay. We decided to stay at The Wilson Arms as they were doing an amazing deal on Groupon, and we definitely were not disappointed. The staff were so friendly and welcoming. The food was amazing and we did pass our compliment on to the talented chef. The pub is very quaint with a lovely log fire and daily papers were there for the guests which we thought was a lovely touch. 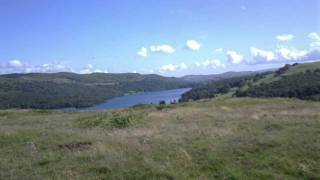 We will definitely be back to this little Lake District gem. I stayed with 3 others over Valentines weekend, we were 2 couples and our dogs and we had an amazing time. After reading all the very positive reviews on trip advisor prior to my visit the synic in me wondered if the reviews were all kosher, but i am pleased to confirm they are. From the moment we arrived we were made very welcome by the owners, staff and locals drinking in the bar. The bar and restaurant are comfy and cosy and the food served is good quality britsh pub food. We stayed B&B and the breakfast was definately worth it, making use of locally sourced produced. Friday night and the bar was lively later on but absolutely suited us as we were celebrating a birthday. The bedrooms are clean and homely and I would consider all things being equal well worth the money!! The Wilson arms is most definately Dod Friendly and as we have 4 Cockapoo’s we were a little nervous about how it would work with 4. But within an hour they were asleep in the bar in front of the fire. I applaude Matthew and his team for truely making the Wilson arms a home from home and I look forward to visiting again in the near Future! !